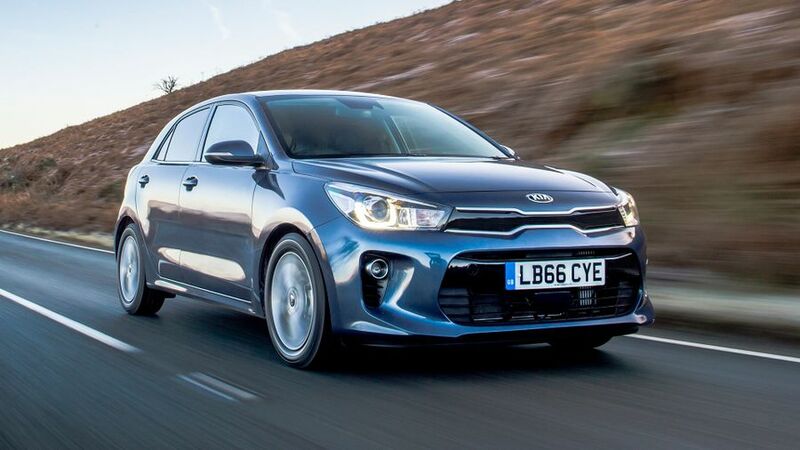 The fourth generation of Kia’s supermini focuses on good value, rather than low prices; but with decent standard equipment and a good warranty, it’ll surely tempt buyers away from the likes of the Ford Fiesta, Vauxhall Corsa and Renault Clio. 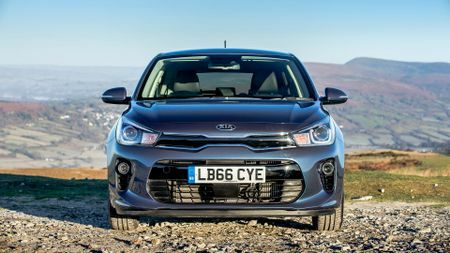 It’s all too easy to sound as if we’re damning the Rio with faint praise, but the abiding impression after our first acquaintance with the car is that it does its job really well. Ok, so it’s not really class-leading in any way, but as a package, there’s a lot to recommend, and there are no major flaws. 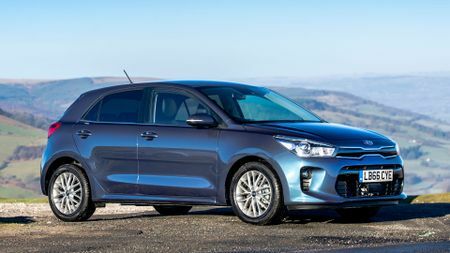 This is the latest, fourth-generation version of Kia’s biggest-selling car around the world. 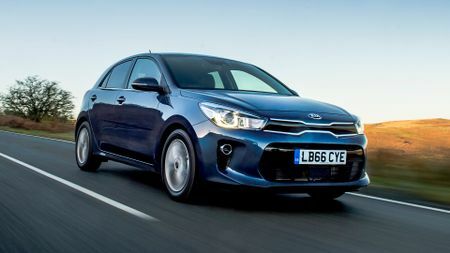 It’s not that popular in the UK – over here, we’re more familiar with the Sportage SUV and Cee'd hatchback ranges – but, generation by generation, the Rio has nevertheless become an increasingly serious rival to the likes of big-sellers including the Ford Fiesta, Vauxhall Corsa and Renault Clio. With a new Fiesta just announced, as well as new versions of the Nissan Micra and Seat Ibiza reaching showrooms soon, it’s clear the new Rio will have to shout pretty loud if it’s to be heard by buyers. The good news – from Kia’s point of view, anyway – is that the car does have plenty to shout about. Not only is this the largest Rio, it also has the latest in connectivity, driver assistance and safety systems, as well as a new suspension set-up that is claimed to give the car a more ‘grown-up’ feel. The full range has just gone on sale, with just one five-door body style, but a choice of four engines, three gearboxes and four trim levels. Prices start at just under £12,000, but for our first experience, we’re driving one of the more expensive versions, mating the 99bhp version of the three-cylinder 1.0-litre petrol engine with ‘3’ trim, which costs just over £16,000. We almost feel compelled to start this review with a caveat, because it sounds like we didn’t really warm to the Rio, when in fact it’s a very decent package. You see, there we go: you’ll find this review peppered with phrases like ‘very decent’ and ‘competent’ – and not without good reason. But, as you may have foreseen, there aren’t that many superlatives. This is a good car, but it’s not the best. On the positive side, it’s a smart-looking thing, and especially so in the ‘3’ trim of our test car. 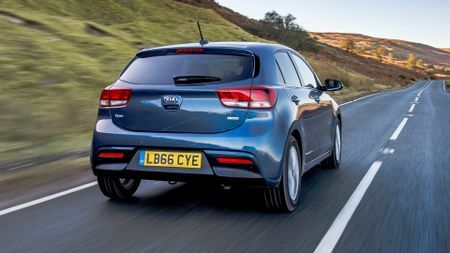 Like all Rios, it comes with body-colour bumpers, door mirror casings and door handles, but this relatively upmarket trim adds 16-inch alloy wheels and extra chrome trim around the grille, as well as tinted glass on the rear windows. 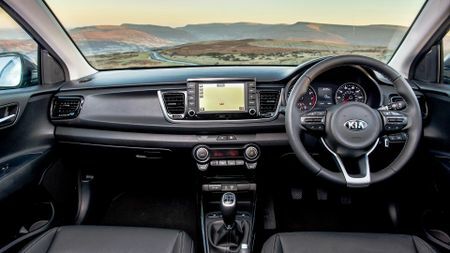 Inside, meanwhile, your £16k also gets you faux-leather upholstery and an infotainment system (including DAB radio and sat-nav), controlled through a 7.0-inch touch-screen. There’s no faulting the amount of room on offer up front, either, with a good range of adjustment on both the driver’s seat and steering wheel. Throw in a cabin whose design (packed full of chunky controls and bulbous buttons) is pretty much the definition of ‘easy to use’, and it’s fantastically easy for pretty much anyone to settle into the driver’s seat very quickly. However, it’s not such a good story in the rear – and especially if there are a couple of long-legged adults in the front seats. 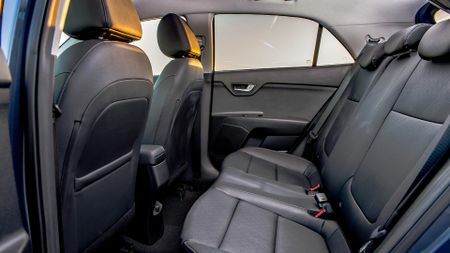 Push the driver’s seat back, and a six-footer behind will find their knees firmly wedged into the seat back, with their head brushing the roof. What’s more, thanks to the centre seat being very narrow, the Rio is realistically no more than a four-seater. Still, you can say much the same of many of the Rio’s rivals, and overall, the Rio is reasonably spacious by the standards of the class. 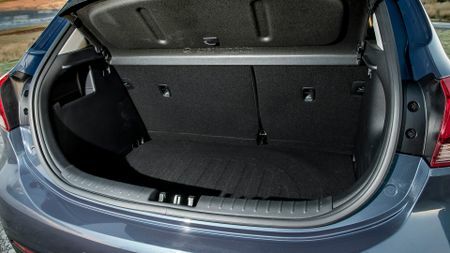 Similarly, while the boot is a decent size (bigger than you’ll find in a Corsa or Clio), it’s let down by the high sill you have to lift things over; and, the 60/40 split seats leave a sizeable lump in the floor when you fold them down. On the road, it’s a mixture of good and not-so-good. Among the positives are the responses of the 1.0-litre engine, which you would be forgiven for thinking wasn’t up to the job. On the contrary, however, it’s a very decent little engine that pulls well from just 1500rpm and, as a result, always seems to be on your side. It’s not what you would call fast, but it’s certainly fast enough in the everyday situations a supermini could expect to encounter. It’s more than quick enough in the ‘Green light Grand Prix’, is more than happy to keep up with the ebb and flow of main-road traffic, and has no problem maintaining typical motorway speeds. True, you can feel a little vibration through the steering wheel at idle, and the engine gets quite noisy when you rev it hard, but neither is unforgivable. Likewise, in typical supermini surroundings, the Rio is in its element: the light steering makes getting around town, and in and out of tight spots, simplicity itself, much helped by the good view to the front and sides. The car sits very securely on the road, and even in the torrential rain that accompanied much of our test drive, the Rio felt very sure-footed through the bends and at cruising speeds on the open road. Our only real disappointment was that the price you seem to pay for that sure-footed feel, is a firm ride. We say ‘seem to’, only because we’re yet to drive a Rio with anything less than 16-inch wheels, so our suspicion that the 15-inch wheels that are standard on ‘1’ and ‘2’ trim may prove a little more comfortable is yet to be confirmed. Finally, while we’re talking about slight disappointments, that light steering means the Rio isn’t the rewarding thing to drive, and some may criticise the car for being uninvolving as a result, but that’s missing the point on a car like this. Instead, we’ll sing its praises for being undemanding to drive, and surely that is more important to most supermini buyers than a bit more steering feel? If you’re in the market for a supermini, you should certainly give the Rio a look. Above all, it does a lot of important things very well: there’s a decent amount of space inside, as well as lots of equipment, and it’s a perfectly undemanding thing to drive. True, some rivals are better in some aspects, but as an overall package, it’s hard to find any major fault with the Rio. Although the Clio is not quite up with the absolute best, there's a lot to like, including its style, sophisticated driving manners and some punchy turbocharged engines. 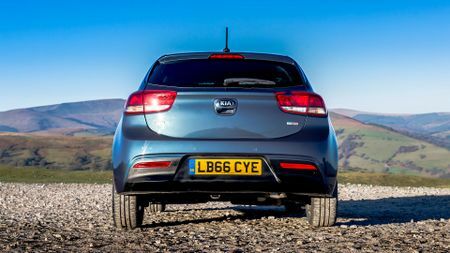 The Corsa is a good package that is smart looking, efficient and well priced, so it deserves the high sales it will get. The cabin is nicely finished, and it has some fine engines. The Skoda Fabia is a very capable supermini, doing a good job in most areas, most notably practicality. However, there aren’t enough areas in which it truly shines, so it can’t trouble the best cars in the class.